Motorcycle Live 2014 - One month to go! Motorcycle Live – the UK’s biggest and best bike show – kicks off in just one month’s time! The nine-day biking spectacular, which includes entertainment for all ages, will take place at The NEC, Birmingham from 22-30 November and tickets are on sale now. Every November, thousands of two-wheel fans and their families make the winter-season pilgrimage to Motorcycle Live to see the next year’s new models in the UK for the first time. This year will be no different, with more manufacturers signed up than ever before – each one showcasing the very latest machinery, from sports bikes and scooters to adventure models and off-roaders. In addition to the new metal, visitors get a jam-packed day of entertainment with Classic and Custom Xtreme zones, the Crank’d live action stunt show, the Behind Bars cinema experience, more than nine opportunities to ride a bike, loads of retail stands to bag a bargain, the chance to meet and greet their racing heroes and the ever-popular Blackhorse stage in the British Eurosport Entertainment Zone – which will again feature non-stop action every day with live chats, games and quiz shows. 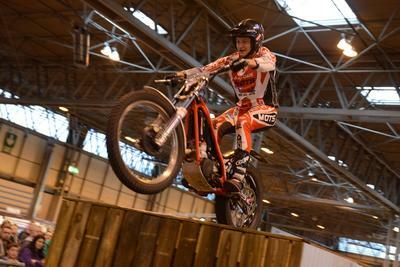 Motorcycle Live takes place at The NEC, Birmingham from 22-30 November 2014. Advance tickets are just £17 per adult, £11 for Seniors and £7 for children aged 11-16* (kids ten and under accompanied by a paying adult go free). There is also a £20 advance ticket, which includes entry to the show and a three-pack of Oxford Comfy neck warmers worth £15. *Advance ticket price, closing date for advanced tickets 5.00pm on 21 November 2014.